There are different versions of the great fire that swept the City of St. Louis, Missouri, and destroyed 23 steamboats and numerous other river vessels moored there. 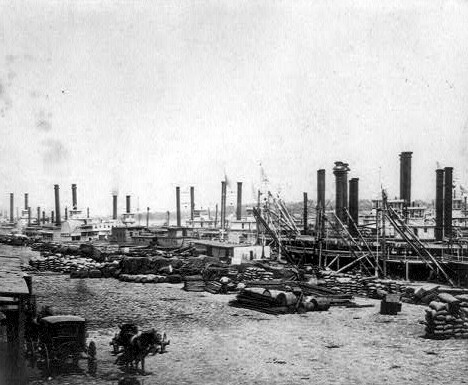 The general consensus is that the blaze started on the steamboat White Cloud, moored at the foot of Cherry Street, at about 9 a.m. on May 17, 1849, and spread along the dock as well as to nearby warehouses, thus starting a massive conflagration that not only claimed a fleet of boats but took a significant part of the city before the fire was over. A fire of that magnitude overwhelmed the St. Louis all-volunteer fire department, even though it was a well-trained operation with nine hand-operated engines and hose red wagons. The department just didn't have the equipment or the staff to hold back a runaway fire like the one that swept that city. The 1849 fire remains today the worst disaster in the history of St. Louis. In perspective, St. Louis was a bustling riverfront city of about 63,000 residents in those days, located near the junction of the Mississippi and Missouri Rivers. It was the last stop for travelers heading west on the big California Gold Rush, where they could buy supplies and switch riverboats before heading up the Missouri River to Omaha, and the beginning of the Oregon trail west. At the time of the fire, yet another disaster was sweeping St. Louis. There was a cholera epidemic going on, which would eventually kill about 4,500. The fire quickly destroyed the White Cloud, and jumped from riverboat to riverboat, and moved across the wooden docks to the warehouses and other nearby buildings. By the time it was over some 11 hours later, the blaze claimed 430 buildings, 23 steamboats, nine flat boats, several barges, and claimed at least four lives. To stop the advance of the fire, which threatened the entire business district, fire fighters loaded six stores with kegs of black powder and blew them up. Captain Thomas B. Targee of Missouri Company No. 5 was killed in the process. He was laying down explosive in a music store, the last of the buildings to be destroyed, when it blew up. A large residential area of several blocks, also was destroyed. Two or three houses also were exploded at the corner of Market and Second Streets as firefighters battled to halt the spread of the flames. It was said that at least three other people died that day, some of them believed killed by the blasts that leveled the houses. Body fragments later were found in the area. Also the burned remains of a boy were found on the levee. In addition to the White Cloud, the other vessels listed as lost in the fire included: American Eagle, Alice, Alexander Hamilton, Acadia, Boreas No. 3, Belle Isle, Eliza Stewart, Endora, Edward Bates, Frolic, General Brooks, Jacob Adams, Kit Carson, Mameluke, Mandan, Montauk, Martha, Prairie State, Redwing, St. Peters, Sarah, Taghioui and Timour. When the city was rebuilt, the town council passed a new building code requiring structures along the river to be built of stone or brick. Also an extensive new water and sewer system was constructed to not only service the city, but assure an abundance of available water in the event of another major fire.